Support > Frequently Asked Questions > What is the typical, worst case, and surge current requirements for the SLCD43 Module (Part Number 51-0105-01)? These are typical numbers. We quote absolute worst case (400mA) on the data sheet; it is very unlikely that all parts of any particular module will be worst case. See the inrush power on application of power to the module in the image below. 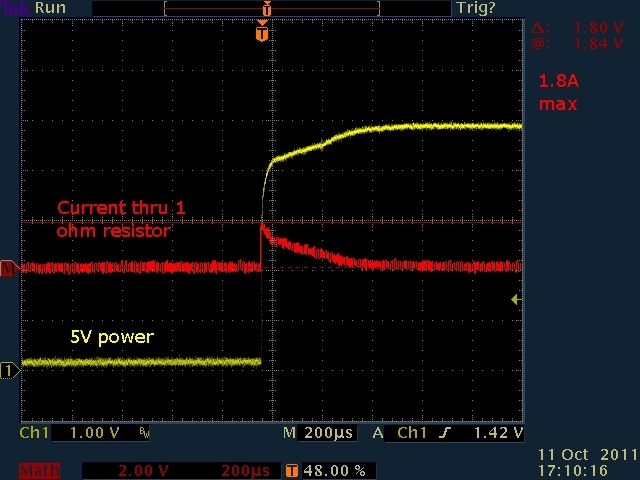 This surge charges the tantalum capacitors on the board. The module contains a supervisor reset chip MCP809T that has a minimum delay of 150mS from power. So as long as the caps are charged in 100mS, all will be well. You could easily limit the inrush current to 400mA and be okay.